awesome picture were are you here? in cayman? swimming with the dolphins? “Hate” is such a strong word…let’s settle on “enviously resent” 😉 Swimming with dolphins is one of my life-dreams…I want a full report!! and that photo looks better than any date i’ve had in the past 6 months! I’m at the Miami Seaquarium for that one – it’s really quite cool. -j: we’ll have to get together sometime soon after I get back, and I’ll tell you all about it! 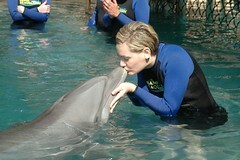 ‘jen: As for the dolphin kissing – so sweet, so soft, I may never go back to people! i leave for a year or 2 and you’re cheating on me with dolphins!?!?!? I really enjoyed the Seaquarium when I was there last — Especially the (oh no, what are those things called…?) …Manatees! Neat animals. Damn, I gotta say this because nobody else pointed it out, but you look SUPER hot in a wetsuit. Why don’t you wear those around the club?